Little visions into the future came today from Samsung’s keynote, where they treated the audience to the flexible displays that their Samsung Display team has been working on for a while. Refinement is still needed on the flexible technology, as it looks a little too jelly. The screen may be robust enough to bend, but it is no use having a bit of floppy plastic. 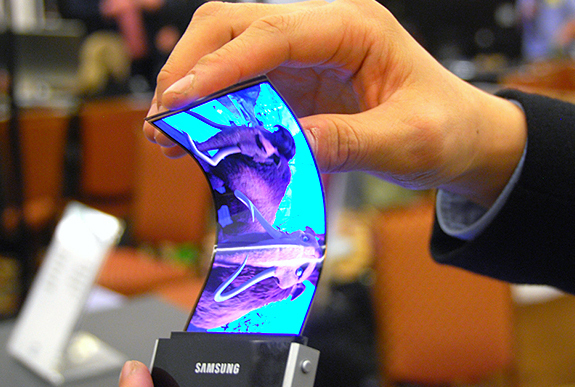 Samsung are sure that companies will soon be able to make foldable and even rollable phones. Samsung are calling the technology Youm and at the press conference at CES, they dived into their whole range of flexible screens. Will it be easy to fold a TV into your pockets, probably not, but we never know with Samsung’s odd vision of the future. The screen was an OLED display and we got a few shots of it working with Windows 8. The ultra-thin form factor, if made more robust and tactless, would make phones a lot thinner, possibly to a few millimetres thick. Nokia and LG have also shown off the flexible technology at CES and we suspect many companies are looking to bring this to the market before Samsung do. Which one prevails in the efforts will be up to whoever can really create a screen that doesn’t flop until it needs to and doesn’t feel like a thin sheet of plastic. We have no idea when this technology will be coming to mobiles. Some may enjoy the new form factor, although others may find that a strong metal case is just as nice.